Most always when a formidable musician and leader is taken from us at the pinnacle of their career, their compadres in music, the former band members, dissolve and try to carry on their respective lives as well as possible. In 1990 when Stevie Ray Vaughan was leaving a summer gig (what amounted to his "clean comeback tour"), his helicopter crashed in foggy weather and we all lost one of the truest and greatest rock/blues guitarists ever to come down the pike. Vaughan's incredible rhythm section, Double Trouble --- drummer Chris Layton and bassist Tommy Shannon --- tried to keep the spirit alive by continuing to play in various bands, and, of course, showed up with Jimmie Vaughan and dozens of well-known musicians for the Stevie Ray Vaughan tribute concert in 1995. Recently released on Tone-Cool records, Double Trouble's debut CD is filled with ear candy that any lover of rock, R&B and blues should add to their collection. One warning: don't expect to hear the ghost of Stevie Ray Vaughan in any of the tunes. 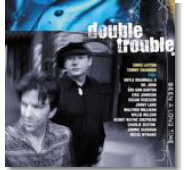 Double Trouble made the right decision by collaborating with many of the wonderful musicians they've encountered in their musical travels, including Arc Angels bandmates Charlie Sexton and Doyle Bramhall II, Susan Tedeschi, ex-Storyville vocalist Malford Milligan (another Double Trouble incarnation), guitar virtuosos Jonny Lang, Kenny Wayne Shepherd and Eric Johnson, and last, but certainly not least, Dr. John. To put out anything else would have been sacrilege to the spirit of Stevie Ray Vaughan. The only nod to their former leader and dear friend is a 32 second hidden live track that expertly shows the trio's solid form. The tunes range in style from acoustic-tinged soul like the opening track "Cry Sky," featuring Malford Milligan's soft laden interpretations, as well as "Skyscraper," where Milligan once again lends his talent in a more rock vein. Other highlights include "In the Middle of the Night," which gets down and dirty with the blues stylings of Stevie Ray's brother Jimmie Vaughan on guitar and a vocal partnership with legend Lou Ann Barton. Susan Tedeschi delivers strong vocals on an interesting remake of Led Zep's "Rock and Roll," coupled with the original fire of Jimmy Page's guitar work this time supplied by Kenny Wayne Shepherd. A slow blues melody closes out this superior collection by piano master Dr. John with "Baby, There's No One Like You," featuring an acoustic guitar solo by Willie Nelson. Most of the material here is either co-written by Double Trouble or remakes of wonderful standards by luminaries like Muddy Waters and Johnny "Guitar" Watson. Either way, you're bound to enjoy this musical journey by one of today's super rhythm sections, Double Trouble. All contents Copyright © 2001, Blue Night Productions. All rights reserved.